Monday was a productive day and I had a real nice selection of pens to choose from… not my entire arsenal but a great sampling. I decided to give my Staples OptiFlow in blue a good workout. House brands are not a sure thing. I am happy to report that Staples got it right with these. The pack of 6 pack includes 2 black and blue and one each in red and green. They are a 0.5mm rollerball with a slightly thicker than average barrel. The cap posts securely and makes a nice solid click sound when replaced. The blue ink is a true blue. The 0.5mm line is average for the size and can be seen next to the black UniBall Vision 0.7mm in the pics. 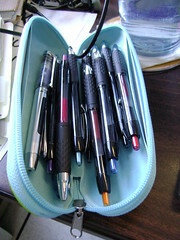 I haven’t experienced any skipping or trouble writing with these pens yet and I don’t foresee any issues in the future. Wednesdays are my days off and I like to try to do something fun. Today Matt and I went to the laundry. 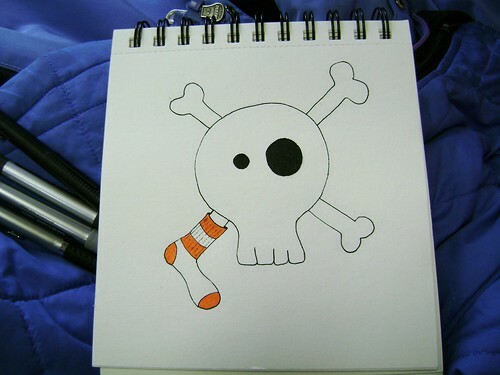 I decided to work on my pirates and socks combo idea. I am happy to share the results with you. I would have liked to have had a Sharpie or Mark-It with me. I think a thicker line would have been much nicer BUT I am going to keep working on this idea so stay tuned. 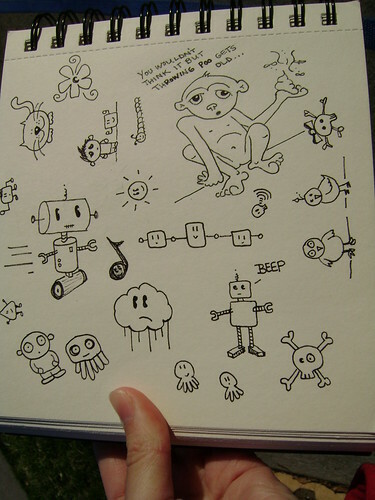 I also filled a page with some cute doodles of robots, shapes with faces, a flying bird, a monkey and other fun stuff. I drew these with my Uniball Vision 0.7mm and accented with a pink Pilot G2 mini and Papermate gel pens. Click to go to flickr - more sizes available. 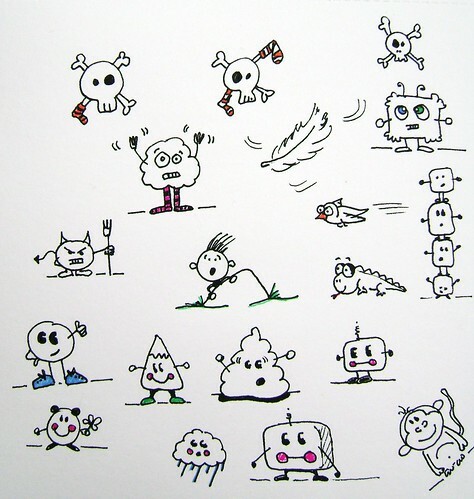 Do you see my doodles getting looser and more free? I feel it when I grab my pen and place the tip to the paper. I no longer pre-criticize and censor. I just let it happen and work with it. I don’t tense up and think about messing up the shapes or ideas. 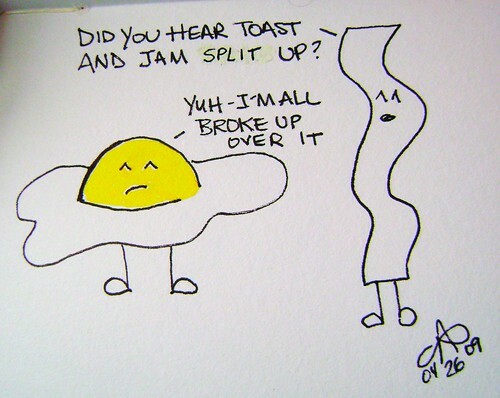 Lastly, I had to share this. Monday at work I found a piece of newsprint with a message for us all. It made me smile… life is short and we should try to have some fun every day. 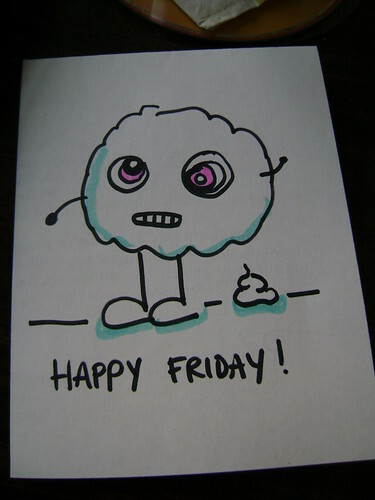 As some of you may know, my Friday left a lot to be desired. I spent my time in school preparing myself for a career in art. In college, a professor told us that a slim percentage of us art majors would work in the field. I graduated with my BA in studio art and began my quest. 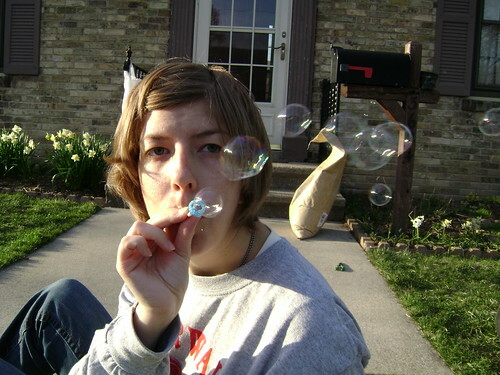 I was laid off in 2004 from a job devoid of art and again a couple of years later from a job that was semi-art related. After finding a new job that would allow my artistic side to shine, I thought I could settle in and let things develop. I now find myself at an impasse. I will figure it all out but right now I feel that static energy deep in my gut that reminds me of the hard times I put behind me. My recent jump back into doodling must have knocked something lose because I keep coming up with different ideas for goofy-doodle-esque creatures. Nothing too heavy or involved, nothing serious or realistic. Here are two more that have fallen out of my Uniball Vision pens. It’s liberating to feel I didn’t make any errors and no criticism is likely since these are silly doodle monsters that can be anything I want. I can be very hard on myself – a person’s worse critic is often themselves after all. 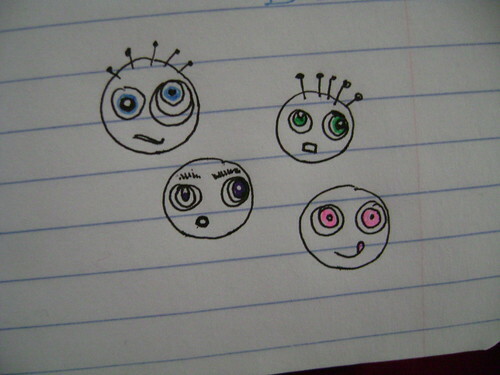 But in doodle-mode I can set seriousness and troubled thoughts aside and just doodle myself happy again. 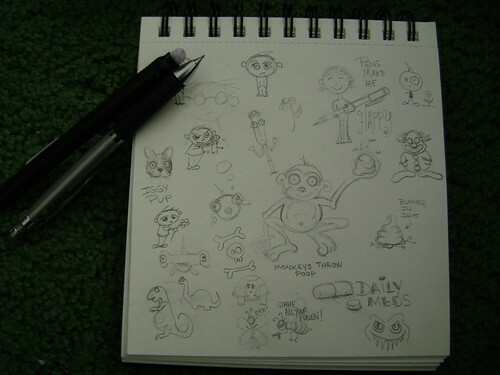 I grabbed my Pentel click eraser and my new Apex mechanical pencil and got to doodling this morning after a few games of Scramble. 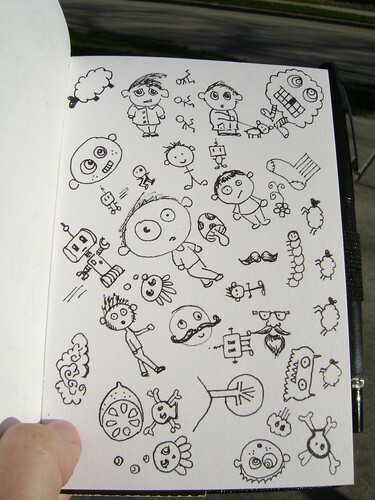 Matt and I ran our errands, grabbed some lunch at OCB (Old Country Buffet) and I doodled at every possible moment. 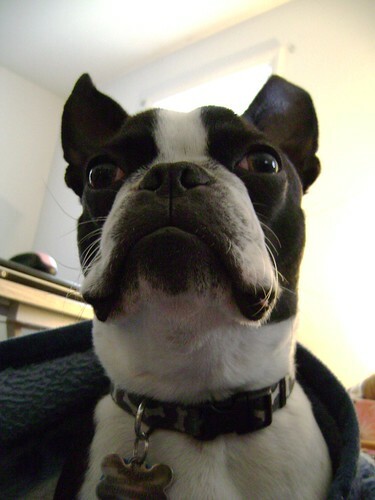 After a stop at my parents and quite a few rounds of Boggle, we came home and took Iggy Pup for a nice walk. The weather today was so nice compared to the rainy and cold of yesterday and Monday. Iggy and I went back out and I did some more doodling while he watched the yard and neighborhood. He also insisted on taste testing the dirt and dry leaves from last fall. mmm yum. click to go to flickr. The point of all this was to get something out – even if it won’t be framed or takes me less time to draw it than it does for me to cap the pen afterward. 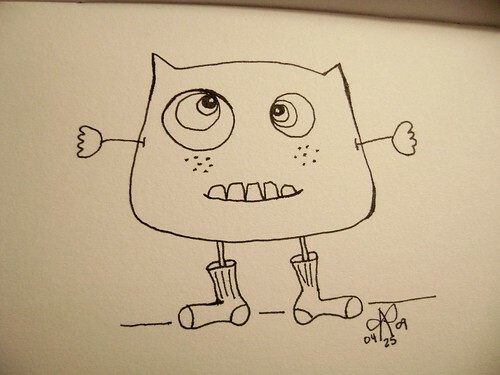 Don’t let yourself criticize your own doodles. I find I have to struggle to keep my inner critic quiet but once I place duct tape over her big mouth, I have a lot of fun. 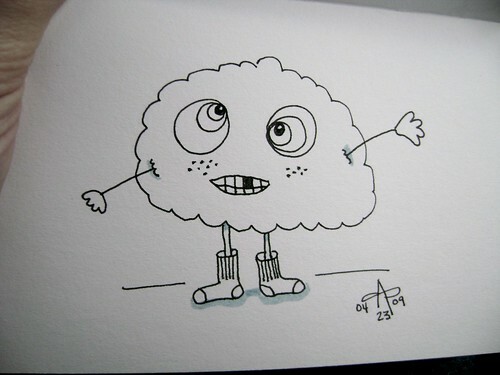 I encourage you to grab a pen or pencil and doodle something – anything. See if you don’t feel lighter after. Take care and be well. Also – Happy Earth Day! It’s been awhile … my apologies for not posting. The good news is I’ve added to my arsenal. More pens = happy! 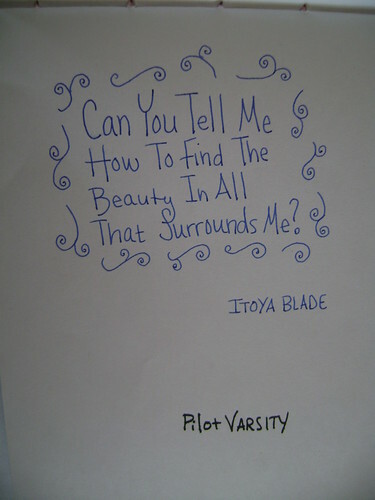 First I need to show you my newest disposable fountain pen – the Itoya Blade. I opted for blue ink since I have a Pilot Varsity in Black. 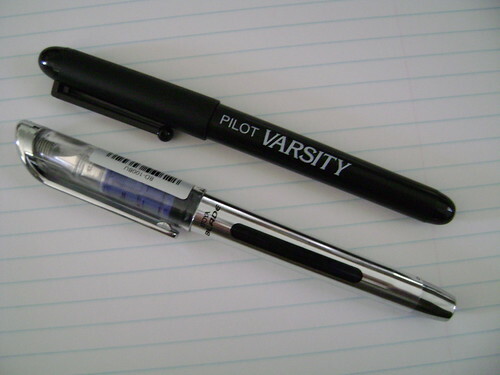 The pen is slightly thinner and longer than the Varsity. I find it very comfortable to hold. The nib is much finer than the Varsity (US variety). 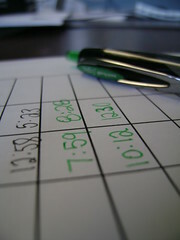 The ink comes out smoothly and there is very little “noise” while writing. The blue is a great shade, not to light or dark. I really enjoy this pen! Both the Varsity and Blade offer a inexpensive entry into the world of fountain pens. 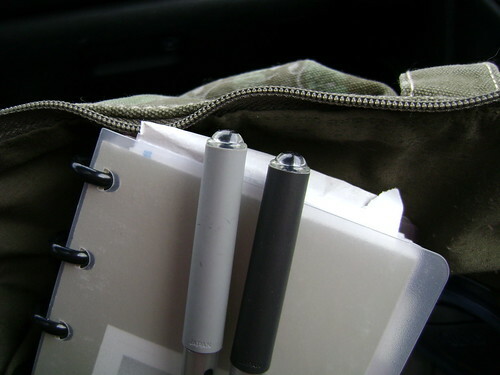 They sport visible ink supplies and smooth writing experiences. 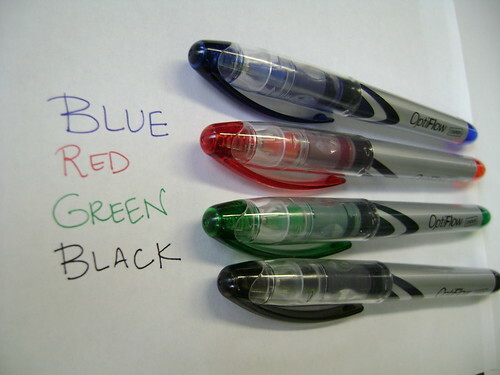 Varsity pens can be “hacked” and refilled with the fountain pen ink of your choice. Unfortunately every Itoya Blade hack attempt I have read about failed and resulted in the disposal of this disposable fountain pen. If anyone knows of a success in refilling one, please let me know. The next addition to my arsenal is the pack of Uniball Signo 207s in 8 marvelous silky gel inks. I have been debating on this purchase for a LONG time. I broke out my black 207 0.7mm for work last week and fell in love with the silky gel ink. That did it – something so smooth and in pretty colors cannot be bad, right? The pack includes Light Blue, Orange, Green, Pink, Purple, Red, Blue and Black. This picture below is off a bit but you get the gist of the colors. The pink is too neon for my liking. I just want a pink gel pen that I can write with without burning my retinas or straining myself into blindness. Any recommendations? Also, the pink seems to write a finer line that the other colors. Maybe its an illusion because the color is so much lighter. The purple is quite dark but rich, I’m pretty sure it will grow on me. The orange is yummy and I’m addicted to it – surprised? I used to green on Friday. It was a deadline day but green just felt right. Maybe its my longing for my time in the garden and for leaves on the trees. 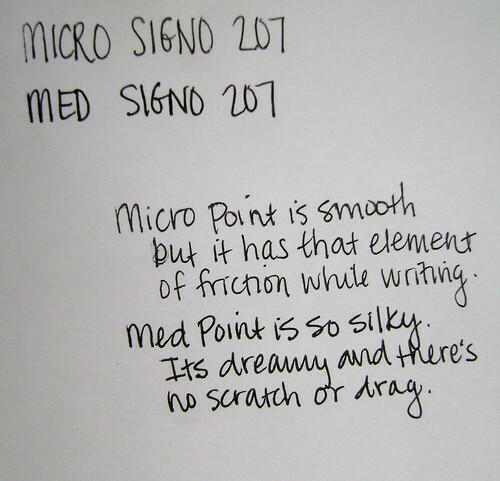 Some of you may not be aware of the point difference between the Signo 207 in Med. (0.7mm) and Micro (0.5mm) so I did a side by side comparison. I doodled a bit last night. This was the result… Doubt you’ll see these in the Louvre any time soon. 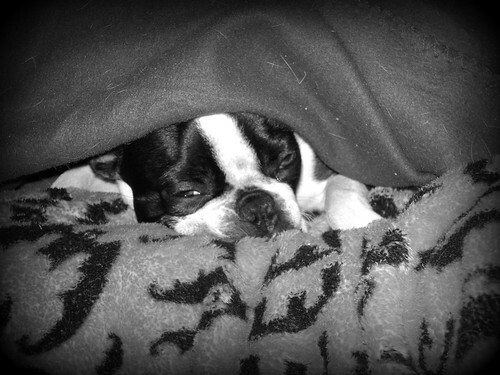 Good night all… Iggy Pup and I have some kitties to cuddle with and some sheep to count. 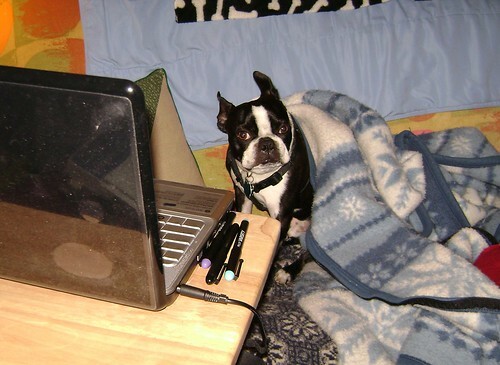 Iggy and I had some time to just relax and surf the web yesterday. We took the chance to get our three Pilot Varsity fountain pens up and writing again. Both had sat unused for awhile and just needed a dip in good old fashioned water. 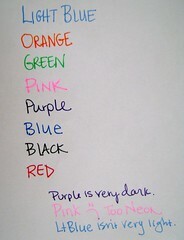 Thanks to all the people who gave me hints – the purple was/is the fussiest. Varsity pens are a great way to enjoy the fountain pen world without spending a lot of money or having a heart attack every time you misplace one. (My Levenger fountain pen from Matt is going to be kept safe and sound here at home so I never have to worry). Click to go to Flickr for more fountain pen pics. Finances are no fun these days. I can almost hear the chorus of “Amen”s from across the globe. My JetPens order is taking a back seat but I have my list. 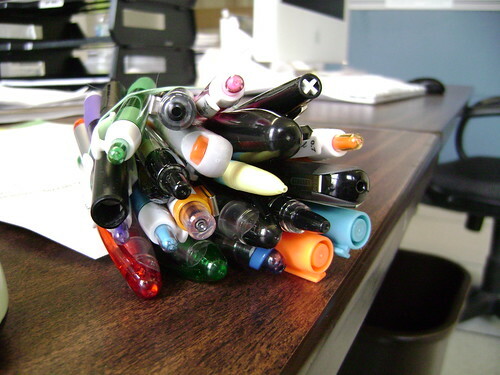 My list of “Going To Have” pens – and it is VERY exciting to me. I’m such a nerd – just the thought of getting my hands on new uber elite writing utensils gives me the squees. I want to thank everyone for the outpouring of advice and recommendations! I spent time with my family today and it was wonderful. My nephews are fifteen this year and it blows my mind how time flies. My journaling lately is filled with thoughts about time and aging. 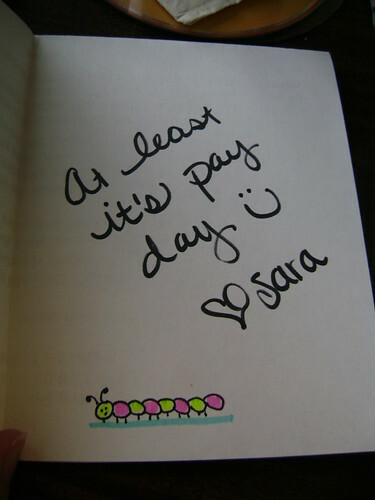 Writing with my Varsity last night made me realize that I would like to improve my penmanship. There is no time like the present. 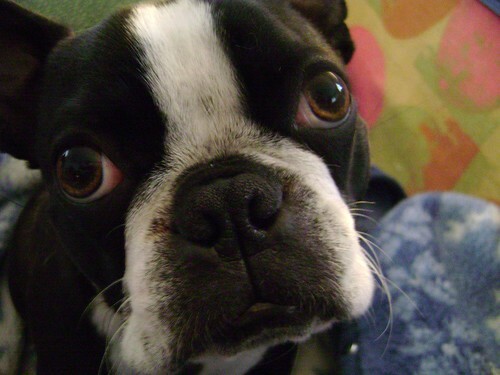 I know I need to practice being more loose and relaxed while I write – which will help my tendinitis dramatically I imagine. Does anyone have any tips or links to share? All in all, this weekend was a good one. 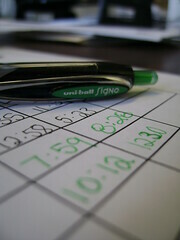 I look forward to picking up a pen or two or three and starting the week right tomorrow.